Today, thirty one cofradías or brotherhoods made up of 6,700 devotees participate in Elche’s Holy Week processions. They organise and enact 33 processions starting on the morning of Palm Sunday and concluding on Resurrection Sunday. The first existing document concerning Palm Sunday dates from 1371 and is preserved at Elche’s Municipal Archives; it was drawn up by the then authority known as the Consejo Municipal; in it, arrangements are made to bestow a sum of money for the Palm Sunday celebrations as well as for the processions on the Monday, Tuesday and Wednesday after this holy feast day. Similarly, in another municipal archive document dated March 21, 1429, account is given of the arrest of Elche citizens who sold white palms in Valencia. The Palm Sunday Procession was declared of International Tourist Interest on July 22, 1997. The liturgy of the procession of palms on Palm Sunday has its origins in the triumphant entry into the holy city of Jerusalem by Jesus Christ. This tradition of Jerusalem spread throughout the Western World thanks to the pilgrims returning to Europe after visiting the Holy City. During the middle ages, this procession became increasingly more significant among the faithful; it got to the point that the Blessing of the Palms became the focus of the religious festivity. A similar phenomenon took place in medieval Elche around the time that white palms were first introduced in the palm procession. Together with the blessing of the palms, a custom began in the form of hanging the blessed palms from the balconies of houses and this practice spread to the West in the middle ages. Elche is one of those places where the tradition has endured; it symbolises the protection of the household by virtue of the palm that has been placed. Another extraordinary fact is the white palm market known as Mercado de Palma Blanca that is active a few days before Palm Sunday; trading takes place in the various markets of the city. 35,000 people took part in the 2009 procession and each participant bore their own white palm. This is the longest-standing procession in Elche’s Holy Week. In the period from the late 16th Century to the 19th century, only one procession took place and this was on the afternoon of Good Friday when the Cofradía de la Sangre de Cristo, took out its three prized images along with La Virgen de la Soledad which belonged to the nobles of the city and El Santo Cristo which was venerated at the Basílica de Santa María. It is believed however that other images might have participated from time to time. A possible candidate was the Santo Cristo which was kept at the Franciscan Church of San José. At the end of the 18th Century, the said procession departed at four o’clock in the afternoon from the Capilla del Hospital de la Villa and took shelter again before nightfall. Starting in 1785 it departed from the Basílica de Santa María. In the 19th Century, due to the incorporation of new “Asociaciones” (the term used to denote the Cofradías of the time), in the General Good Friday Procession, disputes broke out among the Cofradías as to the order of appearance in the procession. The bishop of the diocese, Don Pedro María Cubedo, stepped in to resolve the dispute. He affirmed that the Vía Crucis (Stations of the Cross) in Christ’s Passion would determine the processional order of appearance. Today, the General Procession takes place in the afternoon and a total of twelve Cofradías or Hermandades (brotherhoods) participate. 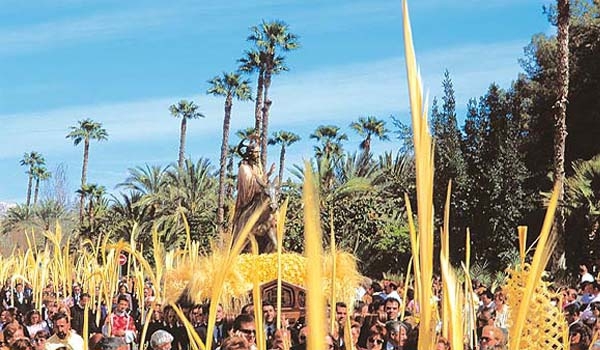 One of the most important traditions in Elche’s Holy Week is the palm craft known as la Trenca del Guió which commences with the arrival of La Virgen de los Dolores at the square known as La Plaza Mayor on the night of Good Friday. At this event, three representatives of Elche’s citizenry, proposed by the Cofradías or Hermandades and chosen by Her Honour, the Lady Mayor of the city, break a black standard before that image of Our Lady, symbolising that the period of mourning is over. The origin of this tradition dates from the end of the 16th Century. This procession dates from the 18th Century and takes place starting from Resurrection Sunday and appears between the images known as Santísimo Cristo Resucitado and the patron-saint of the city, our Lady of the Assumption. The peculiarity of this procession is that people eagerly throw so-called 'Aleluyas' – pieces of coloured paper with images of the Holy Week printed on them – from their balconies as the images pass. It is estimated that over one million aleluyas are cast from the balconies during the procession.